Mangrove plants are unique and can provide a huge benefit for saltwater aquarium owners. They absorb nutrients and phosphates as food, and as a result they can be a very powerful filtration force and help with aquarium algae control in any marine aquarium. 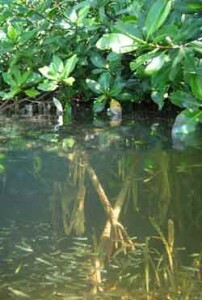 The mangrove plants that are typically seen in saltwater aquariums are purchased as seeds or propagules. Seeds are just that, seeds, and they may have small roots protruding from them. Propagules look more like small single-stem plants with roots at the end of a long, thing stem. Propagules may be easier to place in an aquarium, as the roots are longer and they are easier to place and keep in place. When placing propagules inside of an aquarium, they will need proper head room. They will protrude out the top of the aquarium like plants. You will want to keep a few inches of space between any lighting and the top of the mangroves. If you don’t have sufficient space above the top of your aquarium, you can always consider adding a small mangrove tank that is separate from your main aquarium. The small mangrove tank can have it’s own sand, liverock and lighting, and the water flow is connected to your main aquarium. This will give you an extra space that is more sufficient habitat for the mangroves. Another popular method for placing mangroves is to put them in the sump. If this is done, the only modification an aquarium operator might need to make is placing some lighting above the sump. Mangroves do not need strong lighting, and can survive quite well with medium to low light. They can even thrive off of natural light. If you live in a dry climate, misting the mangroves on a daily basis must be done to keep them healthy. Mangroves will be able to survive off the nutrients in the water and excess fish food. It is recommended to use trace element additives with iron, magnesium and potassium. This will provide the mangroves with the elements that they need to function correctly and live a healthy, beneficial live in your aquarium system. 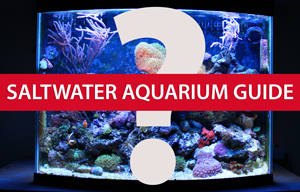 If any leaves fall into the aquarium or sump water, they should be removed. Any excess salt that builds up on the mangrove leaves should also be wiped from the plant on a frequent basis. If your aquarium setup can physically fit and handle mangroves, they could be a great option for you. Mangroves can be a great addition to your filtration system. It should be noted that mangroves aren’t a sole option for filtration. They should be used in conjunction with other forms of filtration and maintenance as well. When many different types of filtration are all combined in one system, optimal results will be achieved and no single component will be overworked.